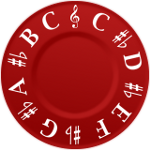 Chromatic Pitch Pipe Pro and Free version on Android market. Chromatic Pitch Pipe is a digital one octave chromatic pitch pipe. Ideal for use with acapella groups, barbershop quartets, as a digital tuner or whenever a pitch reference is needed . - Ability to use pitch pipe with the ringer turned off.